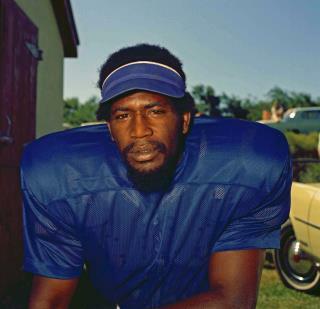 (Newser) – Before he played Moses Hightower in the Police Academy franchise, Charles "Bubba" Smith took some hard hits on the football field as a Pro Bowl player and defensive end for the Baltimore Colts, among other teams. And those hits during his 10 seasons in the league were apparently enough to do permanent damage: Researchers announced Tuesday that Smith was suffering from chronic traumatic encephalopathy, or CTE, when he died in 2011, USA Today reports. Scientists at the VA-BU-CLF Brain Bank—which the New York Times notes released results Tuesday with the permission of the executor of Smith's estate—says Smith had stage 3 CTE, one stage away from full-blown dementia and with symptoms including issues with executive functions. "Prior to his death, Smith was reported to have developed significant cognitive decline, including memory impairment and poor judgment," a news release says, per USA Today. "He was also unable to complete many tasks of daily living on his own, such as paying bills, shopping, or traveling." I dont hink too many of these football players are rocket scientist to begin with. they make millions in their youth and are broke 2 years after they retire. filed under WGAF. spend the time researching PTSD to help the real heroes and let the paycheck players sort it out themselves. Rest in peace Bubba. You were alway cool. Yeah, this sort is very much like what Vietnam vets went through getting coverage of their needs after a war. Except football is a profit model.....so even more liable. Denial and no service, just lawyers getting money and families getting handouts after disasters. Sad. Again. And Again.